The haiku is a classical form of Japanese poetry where each poem consists of three lines and 17 syllables arranged in a 5-7-5 pattern. Traditionally, the haiku would include everyday nature imagery to evoke larger truths, and the final line would juxtapose the first two lines in some way. These days, the rules may be followed more loosely. Like Basho, Hokushi was another famous Japanese haiku poet from the Edo Period. The translation above, by way of Israeli Jewish author and scholar Yoel Hoffmann, illustrates how nature overwhelms culture. The original Japanese haiku, dubbed Hokushi's "death poem," is "built around a pun" in that keshi means both "erase" and "poppy." Much like Hokushi's poem above, this one by Hakuen is also centered on the topic of death and how nature inevitably conquers all. The "seven cycles" refers to the typical seven day life of a cherry blossom (sakura) in the spring, highlighting that even the beauty of the blooms is fleeting. Considered one of the four preeminent figures in traditional Japanese haiku alongside Basho, Buson and Shiki, Issa was incredibly prolific. He left behind journals containing over 20,000 "one breath poems," including the one above he wrote while attending a full moon party at Matsuyama in the Ehime Prefecture on Shikoku Island. 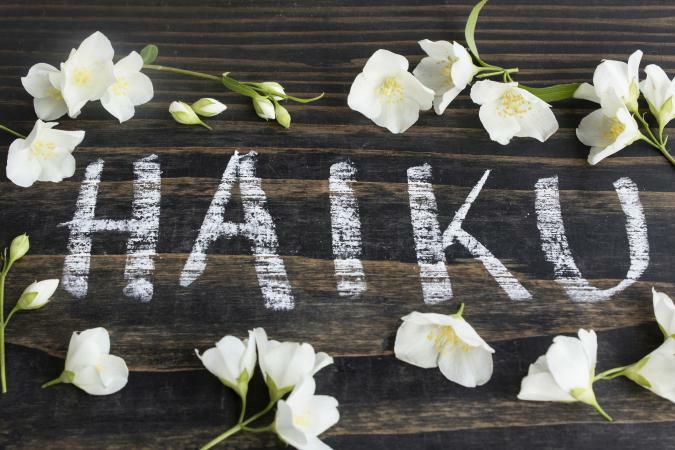 While perhaps the best known masters of the haiku form were 18th and 19th century Japanese poets, the form has transcended language with more modern iterations too. This poem by Michael Dylan Welch departs from the standard 5-7-5 pattern to depict the connection between the heavens above and the earth below. It's all connected.